We are expanding our country coverage in our Global Places™ data with the addition of two new countries – Saudi Arabia and United Arab Emirates. We are also expanding our taxonomy with the release of ten new place categories. The addition of Saudi Arabia and United Arab Emirates to our Global Places™ data brings us to coverage in 52 countries. Our data partners use Global Places™ data across a wide variety of use cases including mapping/navigation, social media, ride-sharing, transportation and logistics, data enrichment in financial services, lead generation, and many more; now, companies with data needs in Saudi Arabia and the UAE can benefit from Factual’s commitment to data quality. Our Geopulse® partners will benefit as well – both Geopulse Audience® and Geopulse Proximity® are built on our Global Places™ data, so marketers can create highly custom audience segments and proximity campaigns in these two new countries. These ten new categories bring our total category count up to 476. Our comprehensive category taxonomy arms our data partners with improved search and in-depth business intelligence capabilities. The new categories are currently live in several countries and will be rolled out globally in the coming weeks. Increased categories allows for more precise and accurate targeting, as the categories are more representative of the world around us. 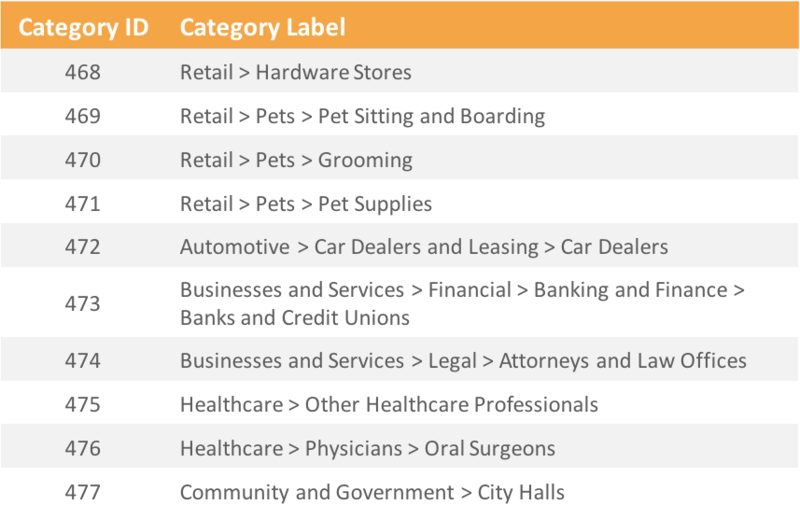 For example, the increased granularity around the Retail > Pets category enables more sophisticated messaging and more fine-grained targeting of specific submarkets of pet owners. The new categories also enable the creation of more nuanced circumstances for our Engine partners. Using the pet example again, app developers can now create different actions/app experiences for their users based on a presence at or near grooming centers vs pet supply stores. The physical world changes on an ongoing basis and we invest heavily in keeping our Global Places™ data up to date. Global Places™ is built from over 2 billion inputs from millions of different sources, and we are updating the data on an ongoing basis as we see new information about places. To give you an idea of the scale of these changes, over the course of 2016, we added 35 million places and removed 13 million places, along with millions of updates to place names, addresses, phone numbers, geocodes, and other attributes. Our Global Places™ data is fully transparent on our website — feel free to explore.